They started digging on our lot this week and we couldn’t be more thrilled. Hailey took this picture on Monday which was day one and I love how the light is shining through the trees. I’ll keep updating progress in posts as construction moves forward. It will be cool to have a diary of the build. 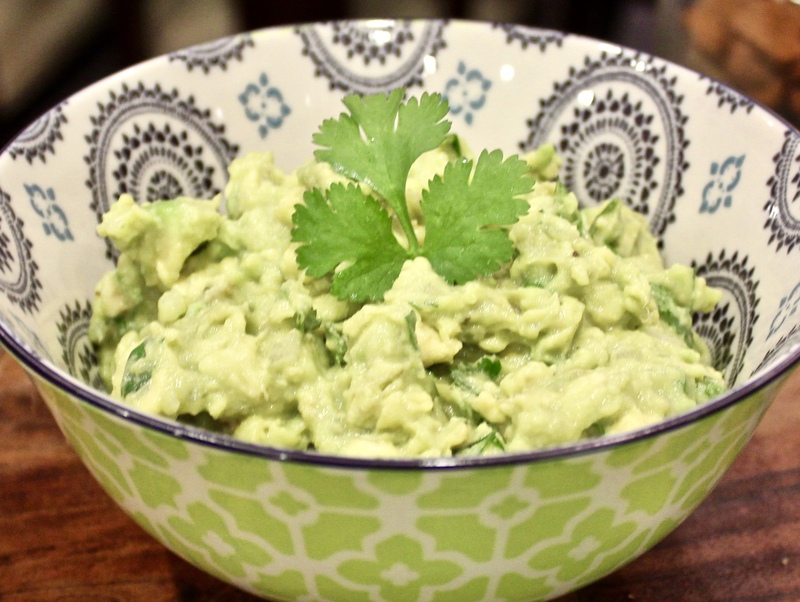 There are a million guacamole recipes out there so I thought I might as well add mine. I always get compliments on it because it’s just really simple and fresh. Of course, it’s a little different each time I make it, sometimes I add some diced, seeded tomato or chopped jalapeno, but this is the basic formula. Ripe avocados, chopped onion for texture, a good dose of garlic, salt, citrus, a little hot pepper sauce, and cilantro for extra fresh factor. I don’t like really smooth guacamole so I only mash it as much as is needed to combine the ingredients, leaving it a little chunky with whole pieces of avocado. Besides the obvious tortilla chips, I like to serve fresh veggies to dip in guacamole. I’ve found sugar snap peas to be particularly delightful but any crunchy crudité will do. And of course, it’s also a great topping for burritos, tacos, and any other Mexican or Tex-Mex dishes you serve. Click the following link for detailed instructions on cutting and pitting an avocado. Score and scoop avocado flesh into a medium-size mixing bowl. Chop onion and add it to the bowl. Grate or finely chop garlic and add it. Juice the limes/lemons – I often use both just because I like to. I remember once having it prepared tableside with lemon at a Mexican restaurant where they declared it was lemon, not lime, that makes the best guacamole. So, I like to cover my bases. Add the juice, the hot sauce, and the salt. Mash with a fork until the ingredients are combined. Chop the cilantro and stir it in along with the black pepper. Give it a taste then add more salt/pepper/hot sauce if you think it’s needed. Serve in a pretty bowl. Today is this guy’s birthday. He would be 88 years old. I miss him a lot still even though it’s been almost 30 years since he passed, which doesn’t seem possible by the way. Dad would love that we now live in Bend, his hometown, that we have a business and are raising our girls here. He would even like how much the town has grown (believe it or not) because he valued change and progress although he might have a problem with his favorite fishing spots being too crowded. He would think his twin granddaughters and his other grandchildren were perfect in every way. And, he would love this blog and the fact that I’m sharing recipes and stories and my love of food, which I got from him. Oops, got a little teary writing that (that’s how I know it’s true). Happy Birthday, Dad. Thanks for continuing to send the rainbows. Dad in the skylight room in his restaurant, The Treehouse, which he always referred to as “the store”.